This new high demand unit from Johnson Pump consists of two parallel connected Aqua Jet WPS five-chamber diaphragm pump integrated with a 5 litre pre-pressurised accumulator tank and inline strainer. The system's design allows for either vertical or horizontal installation. 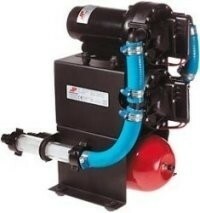 Provides pressurised water for yachts, motor homes, cabins and remote houses. The high flow rate of these units makes them suitable for use with all types of hot water systems, dishwashers, etc. They are particularly suited to larger yachts and remote homes where multiple taps may be in use simultaneously.